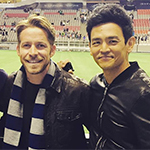 John Cho best known for playing Sulu in the rebooted Star Trek franchise and Harold in the Harold & Kumar films, is making history with his latest performance. Cho’s new movie, Searching, is the first mainstream, contemporary thriller headlined by an Asian-American actor. “I accept that it’s a big deal. 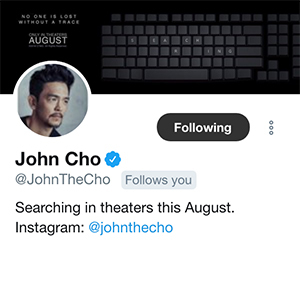 I’m excited,” Cho said of the milestone Wednesday, on the first night of the 41st annual Asian American International Film Festival, opened by a screening of Searching. A con artist used to duping the richest and most powerful becomes unwillingly embroiled in the world of organized crime, while dodging the FBI and dealing with his own demons. Plot kept under wraps. The follow-up to Star Trek: Beyond (2016). A multi-generational tale of one family from 1950's Taiwan to present-day New York. A house is cursed by a vengeful ghost that curses those who enter it with a violent death.